In Part 1 of the Distance and Drive series, I will be talking about cone work and why I feel it plays a big part in distance training. I start all of my foundation work with either cones or gates. I started many years ago with gates and I still use them to this day. One of the main reason I started using cones is they are easier to get (as opposed to making gates), easier to pack around and travel with, and when I want to start teaching my dogs Tight or working on tight lines, the cones work a little better for that. I do still use the gates in a lot of my training and switch between gates and cones quite frequently during training. I will use cones throughout this article, but don’t forgot you can use gates also! I like using cones as they give me and my dogs a stepping stone between foundation/ground work and obstacle work. I will use the cones as “markers” when I start incorporating more obstacle work and harder sequencing into my training. I start with a single cone, my main goal in the beginning of my training is to create value for the cone. I want my dog to really want to find the cone and work with it. I start nice and close to the cone, you can use a clicker to mark them interacting with the cone or I use a verbal marker such as “yes”. I want to mark any interaction with the cone, with my end goal being that my dog will go around the cone. So I will mark baby steps to get there. Sniffing the cone, touching the cone, driving or looking at the cone, etc. I want to really shape the dog to want to go to the cone, we want to build value for that cone. Once I have my dog going around the cone, I can start incorporating body language and directional cues. I can work on my “Go” with the cone, “Out”, “Here”, “Tight” and “Switch” can all be worked on with this cone. I will also start to bring in more cones so I can work on increasing speed and distance, as well as work on my timing and handling cues. One big component that I love about starting my dogs with cone work is that I can build their confidence. Building your dogs confidence is crucial to any kind of distance work. We want our dogs to be confident in their skills and confident in our handling cues. 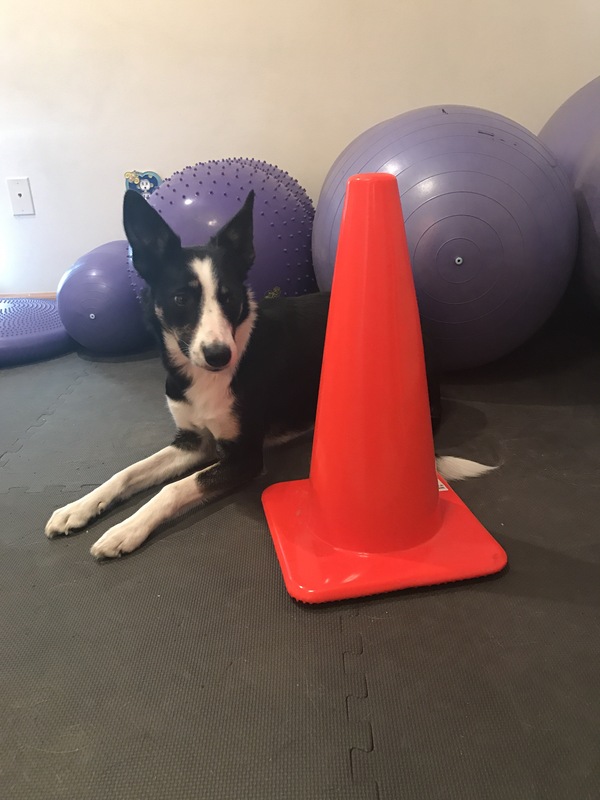 Once I feel that my dog understands all of my various handling cues and we are ready to move on to sequencing and incorporating other obstacles I will use the cones as “Markers”. I will use the cones next to the other pieces of equipment as kind of a stepping stone between the foundation work and sequencing work. I want my dog to really drive towards the jump for example, so I will place the cone next the the jump as a marker. Because we have spent so much time with the foundation work and building value for the cone, my dog will see the cone and drive to the cone, which will also drive them to the jump. I will also use cones in-between my discrimination obstacles. So for example, I can place the cones (i use about three) in between a aframe/tunnel discrimination. So when I cue my dog to go Out, they will see the cones and go to the outside of the cone, which will put them in the tunnel. And I can easily fade the cones by removing them one at a time as the dogs gets more proficient with their discrimination skills. In the next article in the series, I will go over my directional cues, how I teach them, and how to use them at a distance. Thank you Amanda, l did your directional/ distance course, it helped build confidence for my dog while learning jump grids. I love watching you &amp; your dog. Thank you Amanda, l did your directional/ distance course, it helped build confidence for my dog while learning jump grids. I love watching you & your dog.